Because this month we’re building a profitable Shopify store from the ground up! Yesterday we revealed 3 Pricing Strategies All Shopify Store Owners Need. 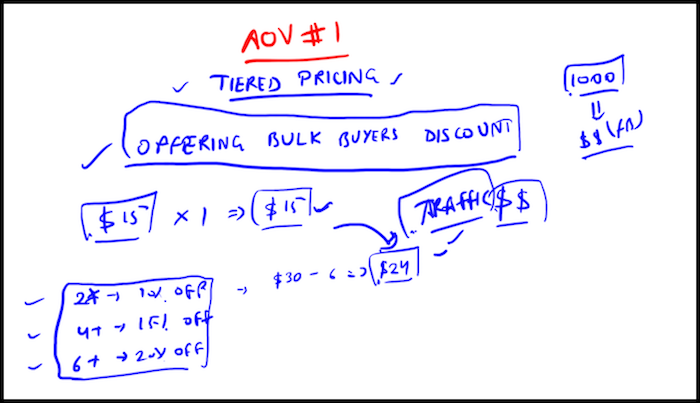 Today we cover how to “Increase Order Value” with tiered pricing. Aside from great copy, Tiered Pricing is the most effective way to sell your products. With Tiered Pricing you’re giving your customers a selection of various yeses. Instead of presenting customers with a single option and putting them into a buy or don’t buy situation, you allow them to select the purchase plan that best resonates with them. Let your customers choose plan or product package that best aligns with what they value. Sure, a majority of your customers might purchase your lower price point, but a smaller group will purchase your higher priced plans, increasing overall revenue, without an increase in customers. 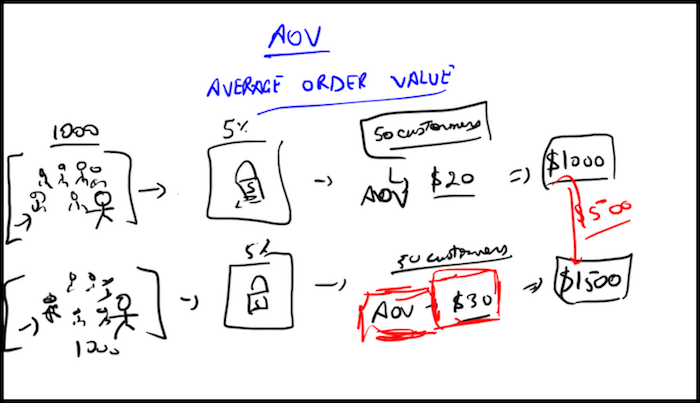 Average Order Value or AOV for short is the average purchase price for customers. If you have 50 customers with an AOV of $20 you’d make about $1000. Simple or not, Tiered Pricing is an incredibly powerful e-commerce tactic, and also incredibly overlooked. This is a huge purchase incentive and the easiest way to increase shopping cart value. When you offer customers who are purchasing multiple products from you an additional discount, a couple things happen. The first is they feel so grateful for your kind gesture that they subconsciously wish to give back to you by purchasing more. The second thing that happens is they simultaneously feel like they’re getting over on you with that great deal you just gave them and the fear of missing out sets in, resulting in a more full (digital) shopping cart. So without increase our ad-spend or traffic you’re offering powerful incentive to increase the order value for anybody shopping at your Shopify store. With Quantity Discount App from Shopify, it is much easier and more profitable to sell more to one customer but with a little discount than to attract another customer. Offer to your customers tiered pricing that motivates them to buy more. Set up different discounts for different quantities of products a customer buys. At the checkout a customer will see the total price with a discount. Login to your Shopify Store and click “Apps” from the left sidebar. Once the app open, click the “Setup” link. Now follow the 4 prompts to set up the rest of the app the way you want it to appear. Average Order Value will be the 5th box displayed. That’s it for Day 21 – Well done! P.P.S. Click here for Day 22!